RAINFOREST SEAFOODS is very excited about the investment the company is making in St Vincent and the Grenadines (SVG). So says Chief Executive Officer (CEO) Brian Jardim. Speaking during the signing of the contract between his company and the government at the Argyle International Airport (AIA) on Wednesday, Jardim said his company’s relationship with SVG began three years ago and it is one of the most embracing relationships thus far, although he has set-ups in other places including St Lucia and the Bahamas. 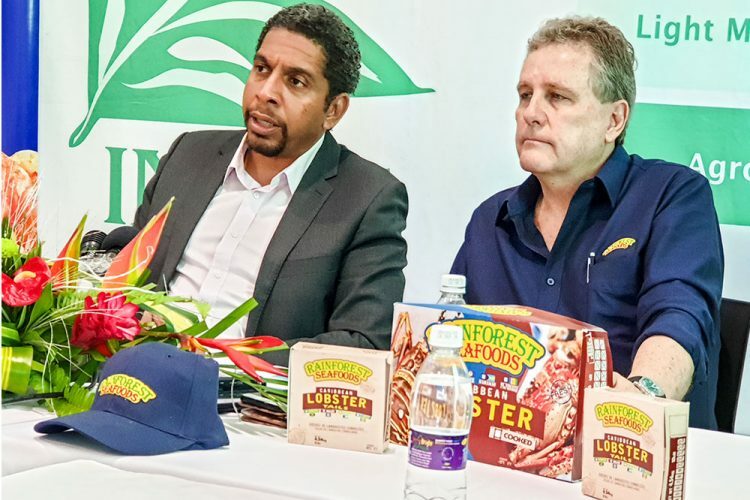 “We are going to hit the ground running, we are very excited about it…,” the CEO told persons at the contract signing event which now allows Rainforest Seafoods to move forward with the building of a seafood processing facility at Calliaqua that is expected to be completed in about 12 months at a cost of EC$10 million. Jardim told reporters that the facility will be built to European Union (EU) standards “and better” and will make Rainforest Seafoods the largest single Caribbean exporter in the world. He added that they are already the largest seafood exporter in the Caribbean with 30 markets including Japan and Greece. The company is hoping to buy, on a large scale, live lobster, conch, sea cucumber and other fresh seafood and according to Jardim, the AIA is one of the reasons the project is possible. He said live seafood is where a lot of money is earned, and they are glad that the AIA was built as it allows them to get the seafood to the wider world while paying fishers the best prices. Jardim said his team is looking at the local water supply and the sewage situation among other things as they embark on building their facility that is expected to pump around EC$20 million into the local fishing industry yearly. “We will have a cooking facility, a drying facility… the conch on Union Island is mind blowing,” said Jardim. Addressing the signing ceremony, Prime Minister Dr Ralph Gonsalves said the government must work closely with the Caribbean Regional Fisheries Mechanism (CRFM) and other fisheries entities to make sure that everything is above board in relation to the project. He added that in a few other countries, poaching, climate change and over fishing have created a problem with the conch supply, so we have to be careful that from the very beginning we put plans in place to address this issue. The Prime Minister also stated that the introduction of Rainforest will not reduce the quantity of seafood that is available to locals. He said he is hoping that Rainforest Seafoods plays an important role in the Calliaqua community. The Rainforest team comprised general manager Jerome Miles, business development manager; Benjamin Jardim; Max Jardim (responsible for exports); Zachary Jardim; operations and projects director Christopher Dickinson; and marketing manager Bethany Young.